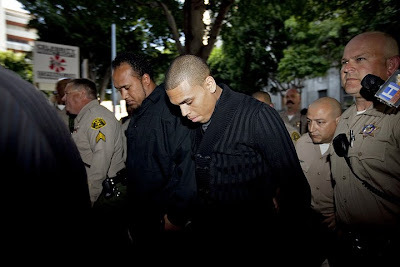 Singer Chris Brown arrived at the Criminal Courts building to enter his plea in the assault case against him. Chris Brown arrived in a black SUV, looking only at the ground as he passed a gauntlet of paparazzi and news photographers, with his attorney Mark Geragos leading the way. Rihanna, his girlfriend who he brutally attacked, is refusing to testify against him. Brown plead not-guilty to the charges against him. The 21 year old singer is expected back in court on April 29, the anniversary of the L.A. Riots.